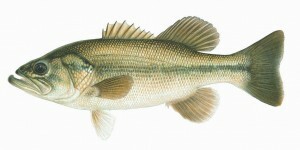 Characteristics: A largemouth bass will be a green colour with a horizontal black band stretching though the middle of its body. Depending on what they eat, how deep they live, the colour of the water, and the structure around them, their colour and range from a pale light green to a deep forest green. One of the best ways to differentiate a largemouth bass vs. a smallmouth bass is that in a largemouth the upper jaw will extend beyond its eye, when its mouth is closed. They can range in size, but a fully grown largemouth can be anywhere from 10-22 inches long from head to tail and can be 1-5 pounds. Anything larger then that will for sure be a trophy largemouth and will give you bragging rights for years to come. If you plan on keeping a few for a shore lunch make sure you check your local regulations on the size limit you can keep. How to handle: I find that largemouth bass are usually pretty tame and for the most part will only put up a bit of a fight. They will attack a bait quite hard, but once hooked you can usually get them to shore or to your boat quite easily. When you land it make sure to watch out for its fins, as with any fish these can be sharp. Unlike many of the large predatory fish, largemouth bass do not have sharp teeth so you need not worry about sticking your fingers inside its mouth to unhook it. If you look at my pictures you will see that I am usually holding it by placing my thumb in its lip. This is by far the best way to handle these fish so as to not hurt them or yourself, but be sure to have a firm grip because if it is still lively it may try to break out of your hold. Where to find them: Largemouth bass love to hang out in warm water usually where there is some cover or structure for them to hide out in. You will find them around tress, lily pads, and at the mouths of streams. Largemouth bass will live in anywhere from 1’ to 10’ of water for the most part. Quiet bays are a favourite hang- out for largemouth bass. The best time to fish them is starting in early summer to the middle of fall. As long as the water is warm these fish will bite all day long but mornings and evenings is when they are most active. Check when bass season opens up in your neck of the woods and get out there on day one, you won’t regret it. How to catch them: If you fish around lily pads and other structure there is a variety of baits that the largemouth will go for, and I mean a huge variety. Anything from spinner baits, crank baits, top water lures, frogs, worms, minnows, and even mice. They really are the pigs of the fishing world as they will devour almost anything that moves. Since they are active for a short period of time it makes sense for them to eat anything they can and fatten up for the winter ahead, especially with the long winters we have here in Canada.